Jason Collins is a former legend in the game of basketball. He was born in Northridge California in December 1978 and has a twin brother Jarron who was also a former NBA player. They attended school together in Los Angeles and both graduated from Harvard Westlake School. During his time at this establishment Jason broke many records in the sport of basketball and his potential as a future Hall of Fame player was there to be seen by all. After graduating he was drafted in to play in the National Basketball Association (NBA), which is the most popular and highly paid professional basketball league in the world. Jason played a total of 13 seasons in the NBA which is a magnificent feat in itself and was first drafted in to play in 2001. During his playing career he played in a host of teams which reads like the who’s who of NBA teams. These teams included the legendary Houston Rockets, New Jersey Mets, Memphis Grizzlies, Minnesota Timberwolves, Atlanta Hawks, Boston Celtics, Washington Wizards and Brooklyn Nets. All these teams are household names in America and during his long career, he played alongside many of the games finest athletes. During my interview with him I did ask who he felt was the greatest player he had come up against. Without hesitating Jason felt that Shaq O’Neal the seven feet two inch (2.2metres) mammoth of a man was by far the most gifted basketball player he had faced. Not only for his imposing size, but because of his ability to read the game and his amazing work ethic on and off the court. Another man he admired on the basketball court was Allen Iverson, who he says, was one of the shortest men on the court at around five feet 10 inch (1.78m) but used his skill and sharp reflexes to undo many defences and score points for his team. 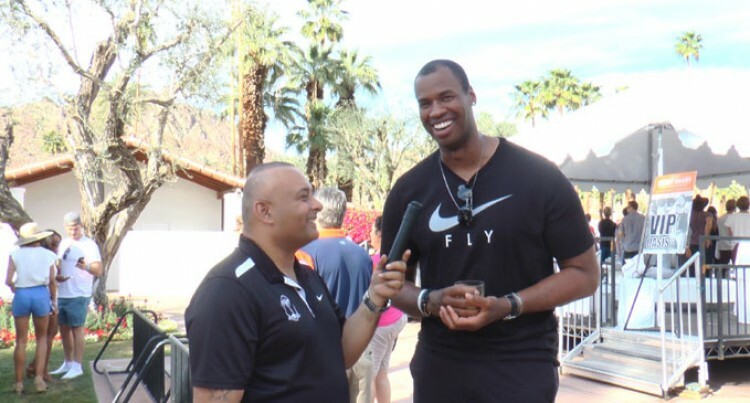 Talking of big men Jason Collins is not so small; standing at seven feet (2.13m) tall he dwarfs everybody around him. In fact the hardest part of my interview was trying to stay focused and keep looking up to this colossus of a man. With hard work and dedication comes fame and fortune and Jason has earned in excess of $80million dollars during his long career at the NBA. Just before his retirement in 2014, Jason Collins was featured on the front cover of “Time Magazine” as one of the 100 most influential People in the World. He has been a campaigner for Gay Rights and fights against Animal Cruelty as one of his charitable occupations. Today he is a well-respected former NBA player who is very happy with the longevity of his career and told me he would do it all over again if given the chance. On his 13-year journey with the NBA Jason recalled it as a dream come true for anyone in America and the fan base and love they received from their supporters was second to none. He described the overwhelming love the fans showered on the whole team wherever they went was truly a blessing and in fact the team would feed off this positive energy to perform at their best week in week out. In this particular interview, which I conducted in Los Angeles, I could not help but sense a feeling of happiness from this fine gentleman. I did ask what the future held for him and Jason told me he was just enjoying today and felt blessed that he was in a very contented time in his life.